The ball position with each club is incredibly important as it makes a huge difference where the club bottoms out in its swing arc. As a general rule, assuming a golfer is not trying to hit a specialist shot (punch, high cut, etc), the ball position should move further forward as the club gets longer. This is because the driver requires different impact factors than a wedge. The wedge, for example, needs a descending blow to produce distance and spin whilst the much longer and less lofted driver needs an ascending blow to create a higher amount of launch and distance. With the irons, one of the most important things to ensure is that irons bottom out in their arc after impact. If you are hitting a pitching wedge with the ball positioned towards the front toe, it would be extremely difficult to achieve a correct swing arc without a huge lateral shift towards the target. For a pitching wedge, the ball should be positioned in the middle of the stance to allow the swing to bottom out its arc just after the ball. As the clubs get longer, the ball moves further towards the front foot. Long irons should be played out of the front of the stance. With their extra length, they should bottom out just after the ball, if the hands are ahead at impact. As a general rule, the wedges 9i and 8i should be played from the center of the stance, the 7i, 6i, 5i from just forward of center, the 4i and 3i a few inches inside the left foot and the fairway woods and driver from just inside the left heel. These are very general guides however as moving the ball position around can drastically affect the angle of attack and ball flight. Using the same ball position with every club will not ensure the most consistent trajectory or best distances. For example, hitting an 8 iron from the middle of the stance is fine however a driver would go very low and not have the correct amount of launch. Getting the ball in the air with the irons consistently involves a slightly descending angle of attack. If the ball is too far forward this becomes very hard to achieve and can lead to tops and thins. This is something many people assume but it could not be further from the truth. Ball position along with other fundamental aspects of the golf set up is incredibly important and should not be overlooked. 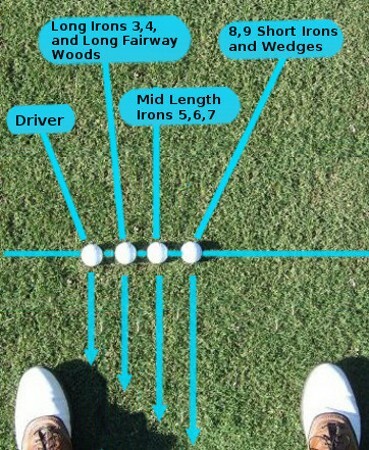 Gradually move the ball position forward as the clubs get longer.